I remember in my younger years wondering why it seemed so hard for a good Spider-Man game to happen. Somewhere along the line, I read that his stick-um powers made it hard to design 2D levels around his power set while maintaining some modicum of difficulty. That seemed like a sensible enough explanation for me, so I just sort of put up with whatever I got until Spidey finally found a decent home in 3D. But SlimeRoom (Free) is making me question that old wisdom, because these little slimes can scale walls and ceilings with the best of them, and there’s no shortage of challenge here. There’s a ton of tense fun to be had with this little game and its absurd pile of stages, and if you have fond memories of guiding Mega Man across disappearing blocks and over deadly spikes, you’ll want to get a piece of this action. In SlimeRoom, your goal is to guide a slime through a bunch of rooms. There’s a flag planted in each room, and you’ll need to touch it to finish the stage. There are some extra stars to collect along the way, and you’ll want those as they unlock new colors and slimes to use. 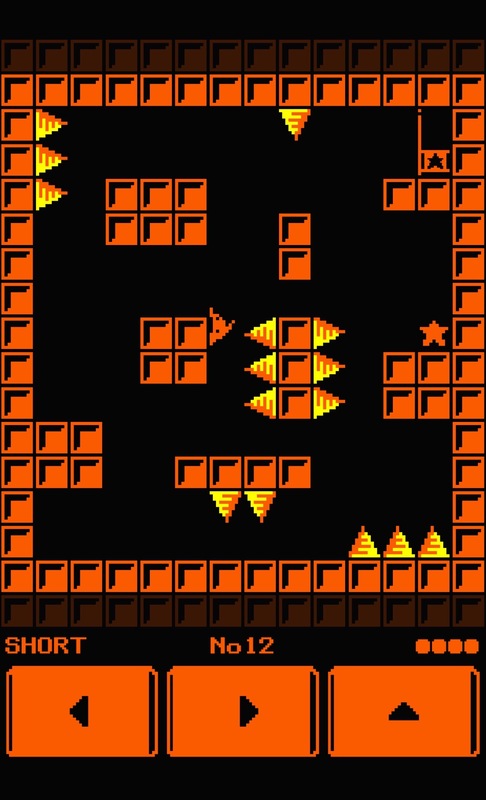 At the start, you’ll only have access to a set of levels made up of single screens. As you clear levels and collect stars, you’ll unlock new courses with longer levels. The sheer variety of gimmicks, traps, and tricks sprinkled across the game’s many stages is impressive, even if many of them are quite familiar to anyone who has spent much time with side-scrolling platformers. Yes, those accursed disappearing blocks are here, and they’ve brought their friends. The slime’s basic moves include moving left and right, jumping, and being able to stick to walls and ceilings. Slime can transition from the wall to the ceiling without much trouble, but can only drop from the ceiling, so you have to be a little careful if you want to get from the ceiling back onto a wall. Slime cannot simply walk off the edge of a platform and stick to the side. It’s not too tough to angle your jump just right to get onto the side of a platform you’re standing on, but you need some clearance above you and good timing if the platform isn’t thick. Although pretty resilient, there are plenty of things that can kill our little slime buddies. Each slime has a set stock of lives for each stage, and if you run out, you’ll have to start the level from the beginning. Granted, losing a life means you’ll have to do that in most cases anyway. No big loss. The slimes can also take over any monsters or objects that inhabit the levels. Hop onto a sailing missile to catch a ride, but remember to hop out of it before it explodes. Slime a cannon and shoot yourself out at high speed once you’ve moved to the right spot. Need a teleport? Glom onto that wisp that’s wandering about. It’s a fun twist that the game uses as a spice now and then without relying on it too heavily. Well, again, at least in the beginning. When the game takes the gloves off, you’ll have to pull off some crazy sequences of actions, with enemy possession taking its proper place in said chains. As mentioned earlier, collecting stars will unlock new slime characters to use, as well as new colors to select. Each slime has their own unique stats in addition to their own appearance, so there’s a practical and cosmetic value in having as many of them unlocked as possible. As for the colors, it’s a way to spruce up the default black-and-white look of the game. Certainly nothing we haven’t seen in other games, but the color changes here also come with new background music tracks. And the music in this game is really wonderful, sounding very much like something out of the classic Capcom NES library. For that reason alone, you’ll want to unlock and try out every color you can. There are a few things that SlimeRoom does really well. First, the controls feel pretty good. Things can get a little mucky when you’re sticking to walls and trying to figure out which direction goes where, but those are rare bits of confusion in otherwise solid gameplay controls. Next, the level designs really are great. There are lots of neat obstacles, and it never feels like it’s sucker-punching the player. Levels are challenging on their own merits without having to rely on cheap gotchas. Finally, the game’s aesthetics work very nicely. It’s using relatively simple pixel art, and it’s certainly minimalist in a lot of ways, but it looks good on the whole and the music is just awesome. The wildest thing about SlimeRoom is that even though it’s a free game with ad support, it doesn’t throw those ads in your face all that often. There’s an ever-present banner at the top of the screen while you’re playing, but your brain will probably tune it out in a hurry due to how much it contrasts with the game’s simple visuals. When you run out of lives, you’ll get a simple full-screen ad that you can dismiss right away. If you never run out of lives, you will never see one of those ads. I didn’t even find out about them until I was dozens of stages deep in the whole thing. I feel like I’m getting away with something playing this game. It’s genuinely enjoyable and is asking for almost nothing in return. If you dig on platforming challenges in the classic style, you’ll want to check out SlimeRoom. I feel like there’s been a recent trend to make games like this stupidly hard or unfair, a style which certainly carries its own pleasures. As a consequence of that trend, it’s become harder to find a platforming game on mobile that tests players without running them into doorknobs all day. SlimeRoom may have old bones, but in the current landscape, it’s a welcome sight indeed. That it doesn’t cost a thing makes it even more remarkable.